Location: Bismarck Sea approximately 30 kilometres from the nearest coast in New Ireland Province. Status: In Development. Nautilus is working on the mining lease application and the development proposal which were submitted to the Government of PNG in 2008. The Environmental Permit for the development of the Solwara 1 Project was granted in December 2009, by the Department of Environment and Conservation (DEC) of Papua New Guinea for a term of 25 years. Type of Mine and Waste Disposal: Nautilus Minerals Is planning to extract high-grade Seafloor Massive Sulphide (SMS) deposits of copper, gold, zinc, and silver in 1600 metres of water. The mining project is being developed in two phases: Phase 1: Extracting and exporting ore with no concentration or processing. No chemicals or blasting will be used for this process. Ore will be stockpiled and shipped from the Port of Rabaul for export processing. Phase 2: Construction of a treatment or concentrator facility. During the mining operation, approximately 130,000 tons of unconsolidated sediment (6 m deep over some of the deposit) and 115,000 tons of waste rock will be removed and pumped onto deeper nearby seabed areas down-slope. Ore will be transported 50 km south to shore, by vessels each 85 m long, for temporary storage at the Port of Rabaul on north New Britain Island. In Phase 1 of the project, the ore will be exported from Rabaul via 3-6 ore bulk carriers per month to a foreign processing facility and smelter. Phase 2 will see the building of a concentrator onshore in PNG and the ore concentrate will be exported to foreign smeltersThe projected mine life is 30 months (at a maximum production of 5,900 tons of ore per day) but could extend up to 5 years and beyond depending upon discoveries of additional mineralization. Ownership and Finance: Nautilus, a Canadian company with headquarters in Toronto, is jointly owned by several of the largest mining companies in the world – Barrick Gold Corporation, Anglo-American, Teck Cominco, and Epion Holdings. The Government of PNG has a legal right to acquire up to 30% equity in the project. Nautilus currently holds 51 exploration licenses in the Bismarck Solomon Seas in the southwest Pacific, covering 107,917 km2, as well as 37 exploration license applications, covering another 88,906 km2. Environmental Setting: The Solwara Project is a large Seafloor Massive Sulfide (SMS) deposit at Solwara 1, including areas of active and inactive hydrothermal vent chimneys and their associated ecosystems. Nautilus is the first company to commercially explore the ocean floor for gold and copper SMS deposits and is currently developing its first project. Environmental Impacts: This project will severely damage the benthic habitat for a rare deep-sea sulfide mound ecosystem and also presents significant risks to other marine systems and resources in the region. It is likely that the target ecosystem will contain numerous rare and endemic (found only at the site) macro-invertebrate species. The active mineralized chimney habitats are colonized by faunal communities that are dependent on chemoautotrophic (e.g. sulphur-oxidising) micro-organisms for energy rather than energy from the sun. Species such as tube worms, bivalves and gastropods (and their associated fauna) cannot exist away from hydrothermal vents. These will probably be new to science (yet to be formally named and described). The Solwara Environmental Impact Statement prepared by Nautilus Minerals Niugini Limited and Coffey Natural Systems stated that “at least 20 new species have been added to the species list at active vent sites.” This is a high rate of occurrence for new species which indicates that there are likely many more species in the mining area that yet to be identified. Such species would probably become extinct due to the mining project. Social Impacts: Potential social impacts are different from those encountered in land-based mining activities. Being the first mining operation of this type they are also difficult to predict. 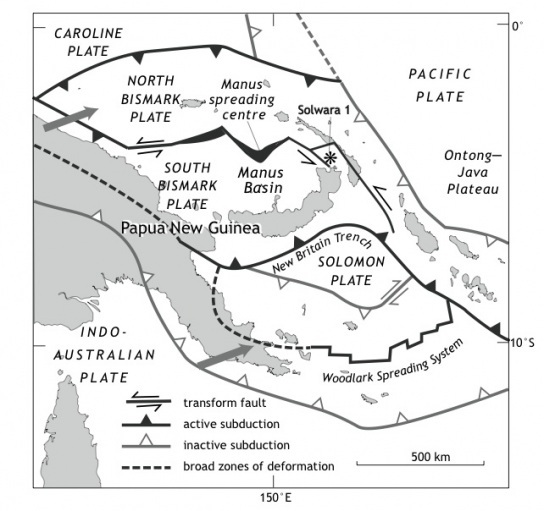 Impacts are likely to be less tangible than those already well-documented elsewhere in PNG. Coastal peoples in PNG feel substantial stewardship for the marine environment. They regard the seas as a holistic entity with considerable spiritual value. Many PNG people express a strong spiritual connection to all components of the ocean environment, including deep-see hydrothermal vent systems even though they may never have seen them. This suggests that social impacts of the proposed mining activities will extend beyond monetary valuation and inferred tenure of marine resources. 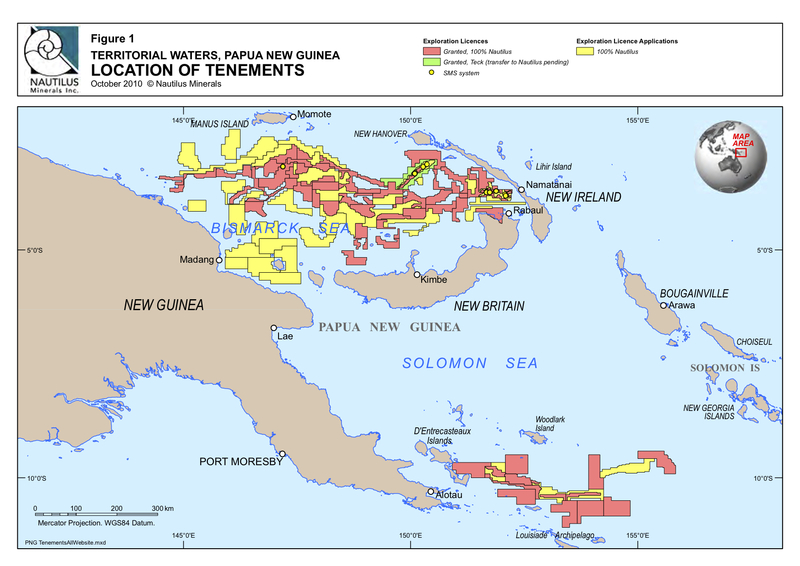 Although coastal peoples in PNG may not live at or directly utilize the offshore mine site should it should not be interpreted to mean that they do not value and/or exert ownership and tenure over such areas.